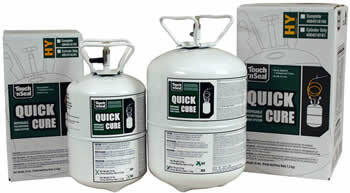 Touch ‘n Seal Quick Cure foams are high performance, single component, moisture curing, Class 1 fire retardant, expanding polyurethane sealants. Use Quick Cure Polyurethane Foam Sealants to permanently air seal and insulate gaps and cracks to block drafts, moisture and insects while improving comfort and reducing energy usage in commercial, industrial, agricultural and residential applications. Common applications include sealing around plumbing, ventilation outlets, electrical junctions, between sill plates and concrete slabs, or anywhere requiring a fast, economical air-sealing moisture barrier. 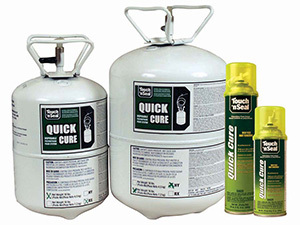 Quick Cure foams work on wood, masonry, insulating foam boards, metal, wire insulation, plastics and sheetrock and are available in both straw dispensed aerosol cans and larger cylinders with hoses and applicators. The easy portable way to handle large jobs. Available in High-Yield (HY) and Reduced Expansion (RX) formulas. Use Quick Cure HY when high expansion is needed to fill and seal larger gaps and cracks. Use RX when requiring controlled dispensing rate and less post expansion. System includes hose and wands. Replacement cylinders and accessories available.